Perhaps this is the one place in Israel where Jesus would still recognize the landscape were He to return today. Out on a boat, away from the shore line, it is possible to drift into the first century and forget our modern life altogether. Hotels, waterside, guests houses, restaurants... these all fade into the shoreline haze. And waves -- sometimes calms, sometime brutal -- caress your vessel as you travel the same waters that Jesus traveled. 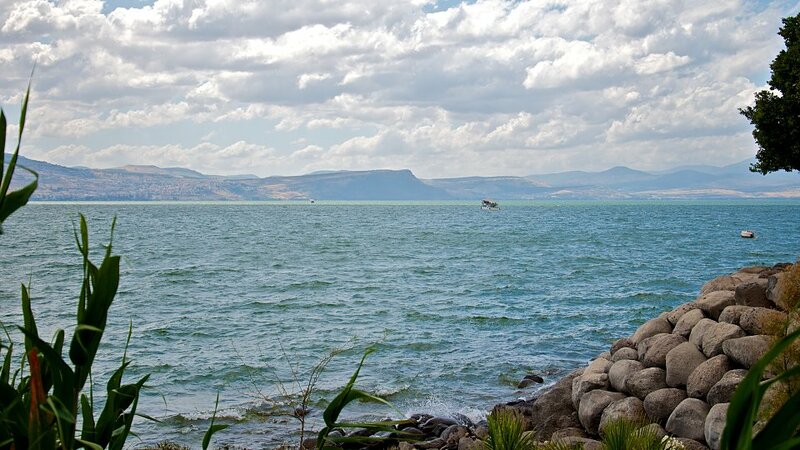 The Sea of Galilee is Israel's largest freshwater lake. Located in the Great Rift, it is approximately 33 miles in circumference, about 13 miles long and 8 miles wide. It is fed with both underground springs and the Jordan River from the north. It is over 600 feet below sea level and is the lowest freshwater lake on Earth. It is not a sea by normal definition, but the Bible describes it as a "sea." It has other names like Lake Galilee and Lake Tiberias. In the Old Testament, it is also called the Sea of Kinnereth (derived from harp in Hebrew). The Sea of Galilee was near the strategic Via Maris which linked Egypt with the empires to the north. Flourishing towns were all around the Sea during the time of Christ. 19: And when he had gone a little further thence, he saw James the son of Zebedee, and John his brother, who also were in the ship mending their nets. 7: And they beckoned unto their partners, which were in the other ship, that they should come and help them. And they came, and filled both the ships, so that they began to sink. One of the scripture passages above recounts the time Peter walked on the water. By faith and by keeping his eyes on Christ, Peter walked on water. When he removed his eyes from Christ and considered the peril of his situation, he immediately sank. What a perfect and timeless illustration of faith in Jesus Christ. If the Christian's faith lies elsewhere, it is sure to fail.